Our son Matthew (9) spent a week at Camp Medeba, a Christian summer camp near Haliburton, Ontario. His best friend Alex Chapman went with him and that made his time away even more enjoyable. Matthew and his younger brother Nathan (8) were both adopted when they were about a year old and have been both a blessing and a challenge to Carol and me. Matthew has a high-functioning form of Autism called Asperger's Syndrome and consequently has some social and sensory challenges. Being away at camp for a week was a good thing for Matt but Carol and I certainly missed him a lot. If any of the Pilgrim Scribblings readers have children or know of children (or adults) with Asperger's Syndrome we would love to hear from you. Needless to say, I was anxiously looking forward to picking Matthew up at camp last Saturday. God has blessed us with two special young boys in addition to our five (5) grown children all in their 30's. So you think we're crazy eh? Maybe so but the blessings have outweighed the difficulties so far (we think). Our Matthew, beside the counselor on the left. 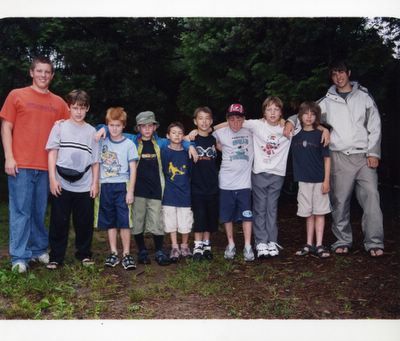 Alex, with the red hair is standing beside Matthew.